Somalia’s security forces need rebuilding to cement gains made by foreign troops against Islamist militants, but how to pay and arm recruits, tackle corruption and prevent rebels infiltrating their ranks remain hurdles for the cash-strapped government. Proving the dire state of the Somali forces, when Islamist gunmen attacked a court in Mogadishu in April, police said they couldn’t tell who was friend or foe, while members of the force say a $100-a-month salary is not enough to inspire loyalty. Emerging from two decades of anarchy, security gains in the past two years have been made largely thanks to African peacekeepers spearheading the fight against al Qaeda-linked al Shabaab rebels. Western powers, long worried Somalia is a launch pad for militant Islam in east Africa and beyond, fear the nation could slide back into chaos if local forces cannot cement gains. How to overhaul its security forces will top the agenda at a May 7 conference in London, where Britain and Somalia will seek more international support at a time al Shabaab are weakened and piracy off the Horn of Africa is at an all-time low. A threat by Ethiopian troops to withdraw from Somalia has raised questions over how the stretched African Union peacekeeping force, known as AMISOM, would be able to plug the gap and highlighted the need for Somalia to build its own capacities. “Somali armed forces need building up, their police need expanding,” Britain’s Foreign Secretary William Hague told Reuters when he re-opened Britain’s embassy in Mogadishu. “There are many huge challenges and dangers that remain and the world mustn’t think that we have solved all the problems or that its help isn’t needed,” he said. Washington and Brussels already help pay African troops and Somalia’s forces. Hague said Britain’s permanent diplomatic presence signaled London’s confidence, although the makeshift embassy’s four metal cabins lie behind two blast walls within the fortified airport. Elected in September, Somalia’s President Hassan Sheikh Mohamud said security was “priority number one, two and three”. It is clear why. Mohamud’s government depends on the 18,000 or so African troops to survive, and the poorly armed, poorly paid and ill-disciplined military is in no position to take over. When Ethiopia grumbled AMISOM was not doing enough to take over places its troops had secured and withdrew in a huff from Hudur, near Ethiopia’s border, al Shabaab retook the dusty town. That signaled how swiftly al Shabaab, now largely confined to rural areas, could regroup if any vacuum is left. Diplomats do not expect Ethiopia to leave the African troops stranded. More a collection of rival militias than a cohesive fighting force, the army lacks sophisticated command structures and has been dogged by soldiers selling off their guns and uniforms. Frequently that gear ends up in Mogadishu’s markets, or in the hands of al Shabaab. More worrying, security officials say, is the number of militants infiltrating the armed forces. In the April attack on the capital’s law courts, the attackers were disguised in official military fatigues. 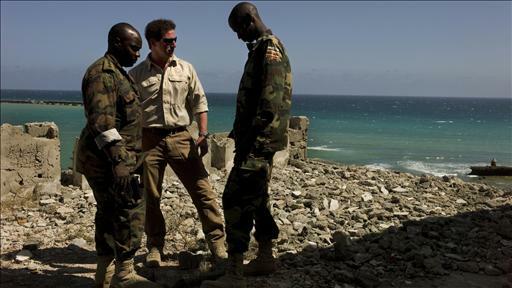 Mistrust is not limited to those in Somalia’s forces. Somalia’s allies are also wary. The United Nations has partially lifted an arms embargo, allowing in light weapons to help Somali forces, but has maintained a ban on heavy arms. “They have to visibly demonstrate they can control what they buy and receive before we go further,” said a Western official. President Mohamud and foreign powers say security sector reform must extend beyond the military to the police force which officially numbers around 6,000, nearly all of whom are in Mogadishu – reflecting the government’s limited reach. Plans to add 4,000 more would still leave the national force less than a third the size of New York city’s police department. A government-approved strategic plan for the police force acknowledged some officers have never received any training while others learned their trade as militia loyal to warlords. One diplomat said foreign assistance to the police force amounted to “life support”. More generosity may be required to make it a more professional security operation. The UN Security Council voted unanimously Thursday to establish the United Nations Assistance Mission in Somalia, or UNSOM, the UN reported on its website. The mission will be based in the Somali capital, Mogadishu, from June 3 for a one-year initial period. The Council stressed the need for “effectively coordinated international support for Somalia’s federal government,” and said the mission’s mandate would in particular include providing assistance to the government and the existing African Union peacekeeping force (AMISOM) with advice on peace- and state building. The mission would also help Somalia coordinate international support, build capacity in human rights and the rule of law, and monitor and prevent human rights violations. The UN noted some progress towards stability in Somalia that has been “torn asunder by factional fighting since 1991.” In 2011, the UN said, Islamist group Al-Shabaab retreated from Mogadishu and new government institutions emerged in 2012 as the country completed a transitional phase toward establishing a permanent, democratically elected government. About 260,000 people died in the famine in Somalia in October 2010 – April 2012, partly because the international community was not quick enough to act, the top United Nations humanitarian official in the country said Thursday. Philippe Lazzarini, UN Humanitarian Coordinator for Somalia, reacted to the findings in a new report funded and commissioned by the UN Food and Agricultural Organization (FAO). The banana trees haven’t grown in yet, but International Campus, as he calls the complex, is the closest thing to a Ritz for many miles. A fortified compound sprawled across 11 acres of rocky white beach, it offers 212 rooms including $500-a-night villas, several dining rooms, coffee and snack shops, and a curving slate-colored pool where sun-seekers can loll away Somali afternoons. “It’s going to be ridiculous!” Mr. Stock said, just weeks before residents began arriving for April’s opening. A few hours later, the jittery sound of gunfire split the warm February air not far from his new hotel—a reminder that the country is still muddling through a decades-old conflict and that there are still bullets flying, bombs detonating. Dominic Nahr/Magnum Photos for The Wall Street Journal Here, Mr. Stock, left, outside Mogadishu, Somalia’s war-battered capital, with an employee, Richard Rouget. Mr. Stock isn’t just anyone gambling on a far-fetched idea in a conflict zone. In an unusual twist of the war business, the 36-year-old American is deeply involved in the conflict itself. In addition to being a real estate developer, his company also helps train Somalis in modern military techniques. Security companies have, of course, been rushing into war zones forever, sometimes controversially. A recent congressional study on wartime contracting estimated that the U.S. spent some $206 billion on outside contracts and grants in Iraq and Afghanistan between 2002 and 2011. Most Western countries have stayed out of Somalia. Contractors like Bancroft partly fill that void. The U.S., which pulled its troops after American soldiers died in the 1993 Black Hawk Down tragedy, has spent more than $650 million since 2006 on supporting the African Union Mission in Somalia, known as Amisom, and its more than 17,000 soldiers. Unlike many security contractors, Mr. Stock’s company, based in Washington, D.C., is a nonprofit not primarily concerned with making money on military support services. In fact, it actually sustains stretches of multimillion-dollar losses, Mr. Stock says. Meanwhile its sister company, Bancroft Global Investment, chases profits by pouring money into war-zone real estate. 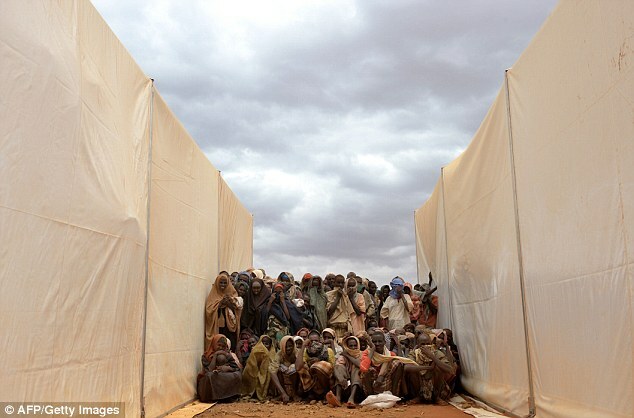 Dominic Nahr/Magnum Photos for The Wall Street Journal Michael Stock develops real estate in Somalia and Afghanistan. Mr. Stock’s gamble: The security outfit will help guide the country toward peace, turning his investments into big money. “It’s like getting in at the bottom of the stock market,” says Mr. Stock. 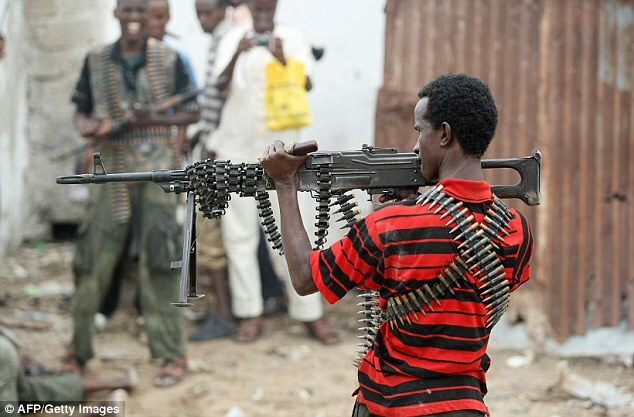 His unusual war operation is making him into a kind of ultimate gentrifier, a mini mogul of Mogadishu, perhaps. His first properties went up in Afghanistan. But Somalia represents his latest push. Along with the new place, Mr. Stock says he has invested more than $25 million in various for-profit ventures, including a “trailer park” hotel built out of shipping containers at the airport, a compound of prefabricated buildings fronting the city’s old port and a cement factory. 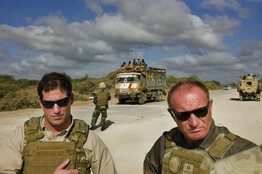 Bancroft is the only contractor supplying military training to Amisom soldiers in the country. Mr. Stock estimates that his team of 100 or so people in Somalia works with roughly a third of the 17,000 Amisom forces at any given time. With dwindling war efforts in Iraq and Afghanistan, other American contractors are moving in, too. A Virginia company, Atlantean, is setting up an airport hotel in the south. Among its board members, according to its website, is former Maj. Gen. William Garrison, who led the mission associated with Black Hawk Down. In the movie version, he was played by Sam Shepard. Maj. Gen. Garrison couldn’t be reached for comment. “There are infinite possibilities in a country that has to be literally built from the ground up,” said Ken Menkhaus, a Somalia expert at Davidson College. These possibilities, however, also include the worst: a return to a hell-ripped Somalia. That reality loomed only weeks ago when militants bombed the capital’s main courthouse, killing more than two dozen people. Contracting out security has its perils. An investigation by the U.N.’s Monitoring Group on Somalia and Eritrea last summer found companies “operating in an arguably paramilitary fashion.” The investigation found a “growing number” of foreign private security companies working in Somalia with diplomatic missions, international companies and individuals. Mr. Stock has attracted some big-name attention. In November, he flew in Warren Buffett’s son Howard to look at potential agricultural projects—part of Mr. Stock’s interest in creating a farming operation to service his hotels, among other things. “He was the only one who would bring me into the country,” said Mr. Buffett, who has been involved in philanthropy around the Horn of Africa. Almost monthly, Mr. Stock commutes here from Washington, D.C. This time his “fast plane,” a 10-seat jet, was in the shop so he borrowed a five-seater Cessna in Kenya from a friend. Accompanying him was a new Bancroft recruit. He had been a part of an Army Delta Force squad that chased al Qaeda in Iraq. “Will we get shot at the first day?” the former soldier asked at one point. Bancroft says it employs about 200 men around the world. About half work in Somalia. Some have roots in elite military forces including the Navy SEALs, French Foreign Legion and British Special Air Service, the employees say. “It’s like an extreme sport,” says one, Richard Rouget, a South African resident and former French soldier. The idea for the business came during a summer job in 1998 with the U.S. embassy in Morocco, where Mr. Stock visited a refugee camp in the Sahara ringed by land mines. “Why hasn’t someone shown them how to remove the mines?” he recalls thinking. 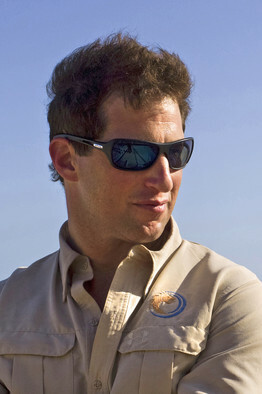 A year later, after graduating from Princeton, he started a mine-removal company. “Like a dot-com,” is how Mr. Stock describes the early days. He had no full-time staffers and spent months meeting people in the field. There was only sporadic mine-removal work, for little money, in some of the world’s most unstable places: Mali, Chad, and Iraq. His family’s wealth helped. His great-grandfather, Lewis Strauss, made tens of millions as partner at the investment firm Kuhn, Loeb & Co. In time, Mr. Stock borrowed some $8 million from different banks and invested about $2 million of his own money. As the U.S. military went after the Taliban in 2002, Mr. Stock’s company landed in Afghanistan and offered services through a local partner, Mine Pro. He invested in the company and built a group to train bomb-detecting dogs and do anything from plumbing to car repair. But his company operated at a loss, he says. It didn’t make money for about two years, the time it took to get his local Afghan partner up to speed and wait for it to win contracts. A more profit-minded security contractor might have called it quits. Mr. Stock, however, had another idea. “My thinking was that you could lose money on security to bet on development,” he says. Afghanistan certainly lacked decent, secure accommodation. Initially he built an eight-bedroom compound in Kabul and another, bigger residence in Herat, the country’s third-largest city. He started a car rental service, too. Eventually, security began paying off, Mr. Stock says. He started receiving a share of his partner company’s contracts, with that revenue peaking at about $1.8 million in 2005. But the bigger money was in his properties. Today, the original two have been expanded into protected city blocks of multiple buildings. They house tenants associated with the World Bank and the International Development Law Organization, among others. Over the past eight years, the real estate and other commercial services like car rental in Afghanistan have brought in about $32 million in net revenue, according to financial documents provided by Bancroft. Much of that money is now being invested in Somalia. “It was like Stalingrad in 1942,” Mr. Stock says of the day in late 2007 when he flew into Mogadishu. The city was a smoky battlefield of bomb explosions and firefights between the Shabaab and the African troops, who had arrived earlier in the year. The Shabaab, Arabic for “The Youth,” had taken over much of the capital. They built power over years, though the bloodshed had begun long before, in 1991, when armed clans forced out Somalia’s military-run government. A person familiar with the U.S. State Department’s policy on Somalia said that the company had helped create an “effective fighting force.” A U.N. official, meanwhile, noted that Bancroft’s training in roadside bombs had reduced deaths among African soldiers. Mr. Stock winces at the terms “mercenary” and “hired guns,” which he considers inaccurate. He calls his men “mentors” who train people rather than fight. Even though they don’t carry weapons, working closely with soldiers, medics and others means that they are in the line of fire. “If the African forces are overrun, we’re all dead,” he says. Dressed in body armor and a helmet one morning, Mr. Stock says he had never considered joining the military himself. “I don’t take orders well,” he joked, riding along in a convoy of armored carriers in downtown Mogadishu, gunners manning the roof hatches. It was part of a sweep Burundi and Somali soldiers for insurgents. The streets alternated between bombed-out buildings and stretches of fresh paint. Soon, a sniper was spotted. Later, a gunfight broke out. Then, an exploded roadside bomb brought the convoy to a halt. By the end, six suspected militants were detained and Bancroft took the bomb for analysis. It was nearly three years of free security training in Somalia, and $6 million out of pocket, according to financial filings, before he landed his first contract with the U.N. Various U.N. agencies have paid the company some $15 million since then and the African Union, with the U.S. State Department money, will have paid Bancroft a total of about $25 million by the end of the year. All along, though, he expanded into real estate. In 2011, he created the for-profit side of the company, Bancroft Global Investment. That year, he sold an 18% stake, just under $1 million, in the Somali properties to a Washington, D.C., developer, Michael Darby. Making real-estate deals in Somalia wasn’t easy, Mr. Stock says. It took “dozens” of meetings with government officials, clan leaders and neighbors of the properties. “You have to spend a lot of time figuring out who is who,” he says. There is no formal contract for the land, but rather “consensus building,” he says, that results in a verbal go-ahead from the collective parties. Mr. Stock made a similar land deal, a public-private partnership with the Somali government for some beach property near the port, but didn’t work out as well. After constructing a facility there and managing it as a residence for the United Arab Emirates, the U.A.E. opened talks with the Somali government about a renewed diplomatic relationship—and sought direct control over the property. International Campus, which he says cost more than $6 million, is now open for business and mostly booked. Beyond the pool and the ocean views, there is a bunker, a trauma hospital and something akin to Mad Max’s version of an auto body shop, where specialized gear heads will fix “the ballistic glass on your armored vehicle,” as Mr. Stock puts it. He expects the new place to break even next year. The trailer park, he says, is grossing about $2 million a year. When his cement-making business opens up, there is an entire city to patch and restore. Still, his work in Somalia is far from assured. The Shabaab remains unpredictable. Weeks ago, militants exploded a car bomb near the presidential palace and before that they struck a beachside restaurant. But Mr. Stock says he’s in for the long haul. “We’re betting on peace,” he says. He is betting on hotels and perhaps houses in the future.